…The MONSTER MASH! 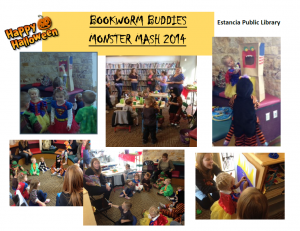 The Estancia Public Library hosted a great Halloween party with our Preschool Bookworm Buddies! Eleven children along with their parents, grandparents, and siblings enjoyed a book-filled, frightless Halloween! One of the mothers went into labor and had to leave early – a very memorable Halloween for them!